Imagine a scenario where everything you will spend money on in 10 years is twice as expensive as it is today. That was what we experienced in the 1970s -- the Consumer Price Index (CPI) averaged 7.4% per year from 1970 to 1979. Now imagine that your investment portfolio would also have to double during these ten years, just to break even on a purchasing power basis. 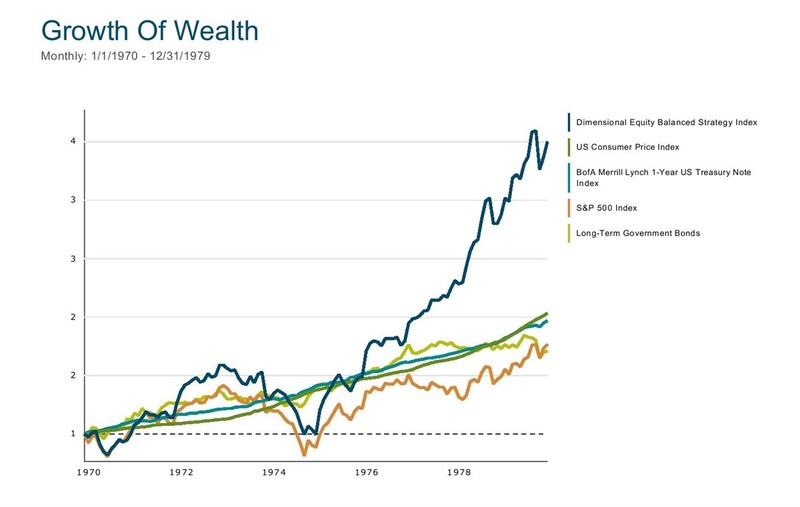 As the chart above shows, this didn't happen with traditional asset classes -- the S&P 500 and Long-Term Bonds. Both had returns over 1% less than inflation. A globally diversified, small/value tilted stock index portfolio (Dimensional Equity Balanced Strategy Index) faired much better -- outpacing inflation by 6% per year. And for investors who needed enhanced liquidity or added portfolio stability beyond what a diversified stock portfolio offered, sticking with much shorter-term bonds (1-year maturities in this example) worked much better; they had returns that came close to matching inflation with much lower volatility. If you would like a second opinion about how your investment portfolio is designed to overcome a variety of different potential challenges -- rising interest rates and inflation as two examples -- don't hesitate to reach out to us. We're happy to review your overall financial situation with you. Past performance is not a guarantee of future results. Indexes are not available for direct investment. Index returns include the reinvestment of dividends but do not include the expenses associated with a real-world investment, including expense ratios and advisory fees. This content is provided for informational purposes only and is not to be construed as a recommendation of any particular security, strategy, or service.